How to calculate your own net paycheck. If you would like the calculator to calculate your gross wages, enter your hourly pay rate. Otherwise, if you know your gross wages or are paid on a salary basis, simply enter your gross wages for the period in the next section. If you would like the calculator to calculate your gross wages, enter the number of hours work this pay period. Otherwise, simply enter your gross wages in the next section. If you would like the calculator to calculate your gross wages, either choose your overtime multiple (overtime rate will be calculated) or enter your overtime rate manually. Otherwise, simply enter your gross wages in the next section. If you would like the calculator to calculate your gross wages, enter your your overtime hours for this pay period. Otherwise, simply enter your gross wages in the next section. Enter your gross pay for the pay period if not already calculated from above entries. If you are required to claim a portion of your tips, enter the estimated total you want to claim for the pay period in the far right-hand field. Or, if you want the calculator to calculate your claimed tips for you, expand the description and enter your total sales, then select the percentage of sales you wish to claim as tipped wages. Select how often you receive a paycheck. Choose Single if single or married filing separately. Choose Married if married filing jointly or filing head of household. Enter the number of withholding allowances. Normally equal to the number of dependents you have, but can be adjusted up or down depending on your circumstances. Note: The standard deduction has changed to a flat amount. If you leave the field blank the new flat standard deduction will be used. Otherwise if you enter a number in the field, the old withholding allowances method will be used. Just use whichever method generates the net pay that more closely matches your actual paycheck. Enter the percentage of your income that is withheld for 401k contributions each pay period (enter .05, as 5). Typically this amount cannot exceed $5,000 annually. Enter the total of any other before-tax deductions per pay period, such as contributions to a Health Savings Account, or a Flexible Savings Account. Enter the total percentage of your state and local income taxes (without the percent sign). If you don't know your state tax rate, select your state from the dropdown menu to display your state's tax brackets. If you've entered your gross pay the calculator will estimate your annual taxable earnings and then highlight your approximate bracket and rate (single filer). Or tap here to see a listing of all states. Enter the total of any after tax deductions, such as health insurance, dental plans, etc.. Enter the total of any out-of-pocket expenses that your employer typically reimburses you for. Gross pay as entered in top of form. Total contribution to qualified retirement plan this pay period. This amount is deducted from your federal taxable wages and it is deducted from your gross pay. Total other before tax deductions for this pay period. This figure is deducted from your federal taxable wages and it is deducted from your gross pay. This is your calculated federal taxable wages for this pay period, which is used only to determine your federal and state income tax withholding amounts. This figure is deducted from your federal taxable wages and it is deducted from your gross pay. If you would like to see how the calculator estimates the federal withholding result, tap here for an explanation along with the withholding tables. Based on your entered state tax percentage, this amount is your state income tax withholding for this pay period (state tax percent X federal taxable wages). Total other after tax reductions as entered in the above form. Total reimbursements as entered in the above section of this form. This amount is added to your net pay. This is your net pay before any claimed tips are removed (tips were already paid to you so they need to be backed out). This is your take home pay after subtracting all deductions and any claimed tips from your gross pay, and then adding back any reimbursements entered. This online paycheck calculator with overtime and claimed tips will estimate your net take home pay after deductions and federal, state, and local income tax withholding. You can choose between weekly, bi-weekly, semi-monthly, monthly, quarterly, semi-annual and annual pay periods, and between single and married. Plus, the paycheck tax calculator includes a built-in state income tax withholding table. Simply select your state and the calculator will fill-in your state rate for you. Note that the default rates are based on the 2019 federal withholding tables (IRS Publication 15 (2019), Table 7, pg 47), but you can select prior years for comparison purposes. 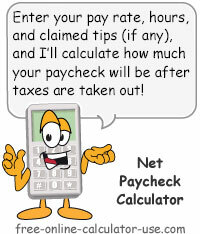 As you use the pay check calculator, please keep in mind that the results are merely estimates. In fact, whether you realize it or not, your actual net pay from your employer is merely an estimate as well. After all, if any unexpected income or tax-bracket related events occur between now and the end of the year (get a pay raise, lose your job, inherit assets, etc. ), your actual income taxes will be different from from the amounts your employer is withholding. In other words, estimating your withholding taxes is far from being an exact science. Your employer is simply following a mandatory withholding guide provided to them by the IRS. But even the IRS guide can't predict your future, so there's no way to know your exact tax liability prior to actually completing your federal and state income tax forms at the end of the year. If you would like the paycheck calculator to calculate your gross pay for you, enter your hourly rate, regular hours, overtime rate, and overtime hours. Your gross pay will be automatically computed as you key in your entries. If you already know your gross pay you can enter it directly into the Gross pay entry field. Enter your gross wages and any claimed tips for the pay period, then select your pay period (the gross wages field is the only required field in the calculator). Under the Filing Status & Withholding section, enter your withholding allowances and any before and after tax adjustments that apply. Click the Calculate Paycheck button. This will estimate your net take home pay based on your entries and display a pie chart showing how your gross wages were divided up. A numerical breakdown of the withholding and deductions used to arrive at the net pay amount will be displayed under the Withholding and Deductions section. How to calculate your take home pay, plus a tip for increasing it. For the purposes of looking up the tax bracket, we calculate the annual gross income based on the current pay period. Note that if you have any tax-deferred amounts (401k, HSA, etc.) withheld from your paycheck, you would subtract those annualized amounts from your annual gross wages in this step as well. Find your tax bracket in the following tables based on your marital status and annual taxable wages. Your bracket will be the row where your annual taxable wages first exceeds the "Excess over" amount. Find the state tax bracket (popup window). Note that if you have any after-tax paycheck withholding (health or dental insurance premiums, etc.) you will need to add them to the Total Withholding before calculating your net pay. Whew! Aren't you glad you found the calculator on this page to do all of the above calculating for you? Have you ever stopped to carefully consider who is ultimately responsible for how much you earn from each hour of work? If you have given this serious thought you will have come to understand that YOU are the one who has the final say in how much you profit from one of hour of work. Because your ultimate profit from one hour of work will depend on whether or not you spend the entire hour's net pay on expenditures that eventually lose all of their value. What most people fail to realize, is that if they invest a portion of each hour's net pay, that one hour of work will continue to pay dividends for as long as they leave the net pay invested. And the greater the percentage invested, the greater the dividends. "No big deal" you say? Calculate your own net hourly pay and then read the eye-opening customized text that follows the form. If you spend the entire $0.00 on expenditures that eventually become worthless, you have limited your net pay for that one hour of work to just $0.00. On the other hand, if you invest $0.00 (0%) of one hour's net pay for 0 years in an investment earning a 0% return, you will have increased your net pay from that one hour of work from $0.00 to $0.00. That's an increase of $0.00 without working any harder or longer than you are now. Why isn't anyone selling you on the benefits of saving? That's easy. There's no money in it for sellers when compared with other products and services they can sell you.